Once again, shots from my China 1999 trip. Whilst in the Huangshan Mountain region, which I’ve featured in a couple of recent postings, I had the opportunity to observe and photograph some wildlife at reasonably close range. When I mentioned animal pictures recently, I wonder how many readers thought…China…animals…Pandas! Well sorry, no pandas. 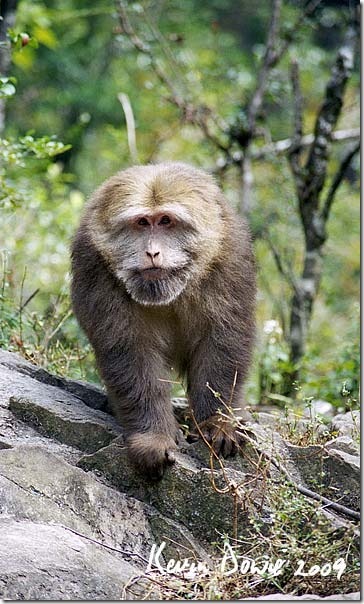 Today's photos feature snow monkeys, more correctly macque monkeys. For several years people have enticed the monkeys to come to the edge of a forest by scattering loose corn for them. Looking at the images you'll notice babies being held close by larger snow monkeys. It may seem natural to assume that the older monkey is the mother but in fact they are young males. It seems that the adolescent males cling to the young ones as a type of security blanket. If they're clutching a young one, presumably they are less likely to be bullied by the larger adult males. All images originally captured on colour negative film.